Experience the passion of Swing, Latin and Ballroom Dancing! NO NEED TO BRING DANCE PARTNER! LEARN FROM THE DANCE CHAMPION!! IF YOU CAN WALK, YOU CAN DANCE - JOIN US! SMALL GROUP CLASS SCARBOROUGH LOCATION!! Class is ideal for both new-comers and experienced students. Sharon will make dance accessible to all people, even those who have no previous dance experience. Beginning with basic step patterns and technique, lessons progress through more advanced skills such as partner turns, syncopations, styling, and more complex turn pattern combinations. Though pairs are welcome, students need not bring partner. All ages are welcome! Dancercise is a fantastic way to lose weight and tone up because it is a fun cardio workout that helps us avoid chronic diseases such as heart disease, diabetes and stroke. It also lowers blood pressure and builds strong bones. Additional benefits include greater endurance, stamina, improved balance and more flexibility. Psychologically, dancercise works like a stress reliever and tension buster. It increases personal confidence. Students will be warming up and cooling down with dance stretches, and learning various dance movements from many different styles including Salsa, Latin, Ballroom, Swing, Hustle, Country western Dance & Hip Hop! 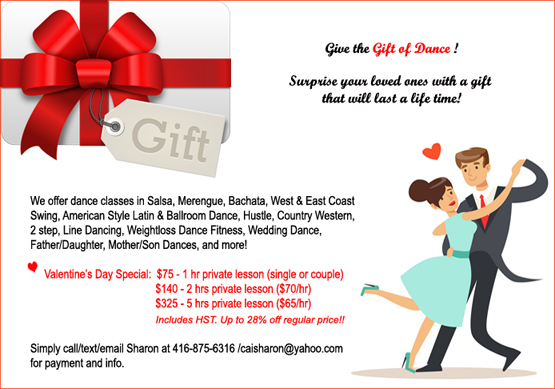 Learn at your own pace and sharpen your dance skills! Private classes are catered specifically to your dance needs. They are simply the fastest way for you to learn how to dance. Lesson times are flexible and can be booked at the availability of the student and the instructor. Private lessons can be purchased individually (per hour) or in a package at a discounted rate. Prices include HST and studio space rental. Note: All classes must be paid in advance. At least 24 hour notice is needed for cancellation otherwise the student will be charged the full rate. Semi-private classes are also available at a very reasonable rate. Can you perform at my special event? What are the costs of the classes?